Mushroom growing kits make it easy to have lots of beautiful and delicious mushrooms with minimal effort. They're fun for beginners just learning how to grow mushrooms and seasoned cultivators alike. A kit is simply mushroom mycelium growing on some sort of material, called a substrate. When you purchase a mushroom kit, most of the hard work of growing the mycelium and preparing the substrate has been done for you. For many people, having to do less work to grow mushrooms far outweighs the cost of the kit. Loose and crumbly sawdust that you use to inoculate other substrates (also called mushroom spawn). Read on to learn more about mushroom growing kits including how they work, advantages and disadvantages, and where to buy them. They're a great gift for curious kids, elderly nature lovers who need an easy project, bored gardeners in the winter, or just anyone who loves mushrooms! Read my review of one of the mushroom kits from Fungi Perfecti here. As the kit already has growing mycelium, all you need to do is create the right conditions for it to produce mushrooms. This usually involves exposing the kit to a cold temperature for a day, and then keeping it watered. The cold simulates fall temperatures, encouraging the mycelium to create mushrooms as a method of reproduction before winter. 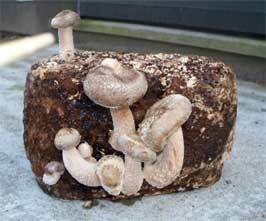 Keep in mind that the mycelium is alive and won't survive if left in a box without air or water. Mushroom growing kits do have a definite shelf life, so use it as soon as you can after it arrives. Here's roughly what to expect to do with various substrates. The instructions that come with your kit will go into more detail. Sawdust/wood chip block - Submerge the block in cool water and put in the refrigerator for 24 hours. Remove the block and place in a well-ventilated, low-light area. Mist with water a few times a day and cover with plastic to keep up the humidity level. Mushrooms will fruit in a few weeks or less. Mushroom log - Soak the log in cold water for 24 hours. Place it somewhere off the ground in a shady spot either indoors or outdoors. Mushrooms will fruit in a few weeks or less, provided that the log is regularly soaked every few weeks. Loose sterilized sawdust - Technically considered mushroom spawn, these kits are the most work but also the most versatile. They have to be mixed in with another substrate and allowed to colonize before they can begin fruiting. Other substrates include cardboard, pasteurized straw, outdoor compost beds, wood chips, etc. It's still pretty easy! 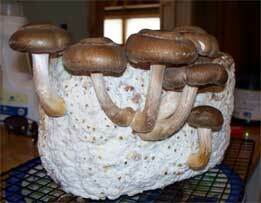 After your mushroom kit has fruited once, keep watering it per the directions. Most kits will have multiple flushes. 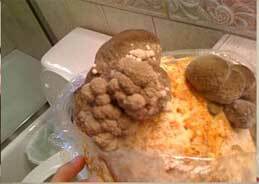 Some will continue to grow mushrooms every few weeks for 2 months up to a year. You may still get some use out of your kit after it stops producing. Just because the nutrients in the substrate have been used up doesn't mean that the mycelium isn't still alive. Throw it outside on a bale of straw, a bed on wood chips, or in a compost pile. You may have mushrooms in that spot next spring! Why Use Mushroom Growing Kits? There are advantages to using mushroom kits to grow your own mushrooms. Minimal effort - There are no holes to drill in logs, nothing to pasteurize, no heavy lifting. Most mushroom kits just need a good location, water, and a little patience. For growing mushrooms, it doesn't get any easier. Cost-effective - In the long run, the money you spend on a kit will probably be less than what the amount of mushrooms it produces would cost at the grocery store. Educational - Kits are a great way to teach kids about the fungal life cycle, as you can watch mushrooms mature right before your eyes. How many home science projects will entertain, teach, spark your curiosity, and taste good? Safe - Growing mushrooms from a reputable kit at home is safer than picking and identifying them in the wild. As many quality kits are certified organic, they're also safer than buying mushrooms from the grocery store. You could be saving yourself exposure to pesticides and various chemicals. They're also fun, rewarding, and produce delicious mushrooms! Initial expense - Although they'll produce more mushrooms for cheaper in the long run, kits still require an initial outlay of cash. A decent kit will usually cost you between $15-$30 plus shipping. Beware of mushroom growing kits in the $50 range! You can get them cheaper elsewhere. Limited amount of mushrooms - Although a kit should ideally produce a good amount of mushrooms, it still won't be as much as if you started a bunch of growing projects from scratch. For this reason kits are not suitable for commercial growers. Poor quality - It's certainly possible to buy a kit that doesn't produce, or that comes with old mycelium. For this reason you should do your research before purchasing, and only buy from a highly rated company. Time - We live in an instant gratification society, and some don't have the patience to wait a few weeks for their mushrooms. Any growing project will take time, and mushrooms are well worth the wait! Don't let these factors turn you off! I've done the research for you, so read on for my recommendation on where to buy. I always encourage supporting local businesses, so call or visit any of these places to see what they have. If local stores don't carry them, or if the quality seems poor, the prices too high, and the selection isn't great then it's time to turn to the Internet. There are lots of places on the Internet to buy supplies to grow mushrooms, some better than others. If you're going to buy a mushroom growing kit, I highly recommend searching through all the various mushroom kits on Amazon . The Back to the Roots kit (right) is a great place to start. This company gets good reviews and seem very dedicated to their product. Good prices - Some ridiculous places charge a lot for mushroom kits, here they're all under $30 (not including shipping). Wonderful selection - Want to grow shiitake? How about maitake, reishi, or oysters? They have lots of different types of mushrooms to choose from, and even some kits especially for kids. Their kits are certified organic, and come with complete instruction booklets telling you how to use them. Easy to purchase through Amazon.com, with better prices on shipping. Great customer service. If you contact them, they'll actually respond to you! Their kits work. They produce multiple crops of healthy mushrooms. I've tried a few different ones now and I've always been satisfied with the results. So if you're looking for growing kits, I suggest giving them a try. Whatever you choose, read through the reviews on Amazon first. But take them with a grain of salt, many times people simply don't give kits enough water and patience. Growing your own mushrooms is a great way to get some delicious food, learn about nature, and have fun. So whether you're learning how to grow mushrooms or if you just want an easy project, give mushroom growing kits a try!